Get LESS Bang for your Buck: Soft Closing Cabinets! Home > Blog > Get LESS Bang for your Buck: Soft Closing Cabinets! 20 Feb Get LESS Bang for your Buck: Soft Closing Cabinets! We all know that cabinet doors and drawers really take a beating over time with the constant opening and closing. The noisy banging of cabinet doors is an all too familiar sound to most of us, but especially to those who love to cook and entertain guests. In the past, inner cabinet features were too often overlooked, but with the ever-increasing popularity of soft closing hardware, more and more contractors are now choosing not to install cabinets with anything of lesser quality than the smoothest door and drawer hardware. 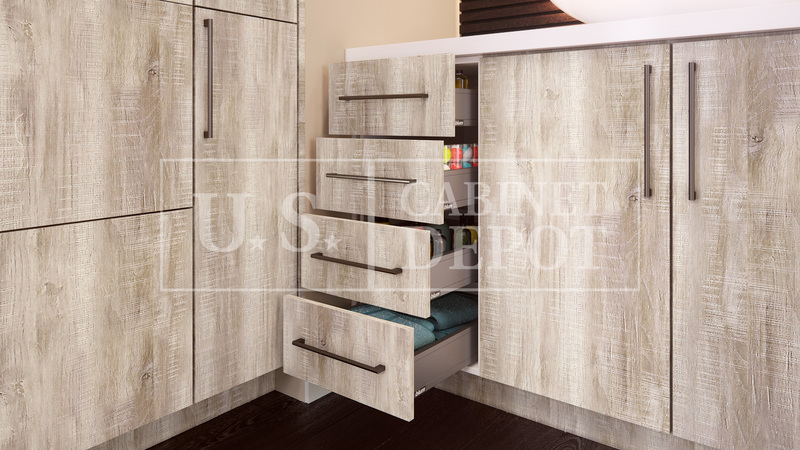 It can not only transform any kitchen or bathroom into a quieter work space, but it will also increase the functionality and longevity of the cabinets. Read on to learn the many important benefits of soft closing hinges and slides. Soft closing cabinets will always close quietly and slowly. When standard drawers are slammed, it can send the contents flying into disarray. Soft closing slides close smoothly to prevent any breakages of fragile items that may be tossed around when the drawer bangs closed. Avoid the inconvenience of having to rearrange the contents of the drawers after each time they are closed, and be assured that all items will remain securely in place. Upgrading to soft closing hardware will put you one step ahead of the aging of your cabinets. These innovative hinges and slides have been proven to extend the life of cabinets, because the gentle movements put less strain on the hardware and ensure that it will last. Soft closing hinges and slides will function just as well in the years to come as the day they were installed inside the cabinet. No more reaching into the back of the drawer. Full-extension drawer slides will bring the back of the drawer box flush with the front of the cabinet, which in turn will allow for easier access to the drawer. Compared to standard ¾ extension drawer slides, soft closing full-extension slides will grant access to the entire drawer box for maximum storage space. Another clear advantage of choosing cabinets with soft closing features is that you won’t need to worry about little fingers being accidentally slammed when the cabinets are closed. The doors and drawers will close slowly and gently enough for said fingers to get out of the way and avoid getting pinched. The kitchen is, arguably, the most important part of a home when it is on the market. It is the space that can either make or break the sale, with the greatest factor being the structure and condition of the cabinetry. Cabinets are generally the most expensive element of a kitchen, so it only makes sense to get it right when the cabinets are installed. Choosing soft closing hardware will ensure that you get the most for your money. Updated cabinets, with this special feature, are sure to set the kitchen apart from that of any other houses a home buyer may be considering. Soft closing doors and drawers are currently highly sought-after and help to make the cabinets that much more appealing.